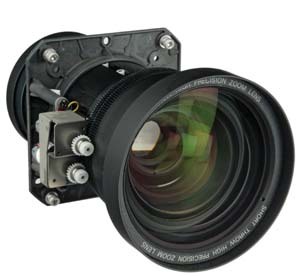 This page details our current stock of projector lenses for various makes and models including the Sanyo HF / Sanyo XF / Sanyo XP range plus Hitachi, Panasonic (single and triple chip) & Canon lenses. These lenses fit the Panasonic PT-EX12k and PT-EX16k models, Eiki LC-XT5, Eiki LC-XT4, Christie LX1500, Christie LX120. We have multiple units and can source most other lenses if we don't have what you require. If you don't see what you are looking for please ask as many models by Eiki, Christie, Sanyo, Canon and Panasonic share common lenses. 1.2:1 wide angle. Fits the XF & HF ranges. All the Sanyo HF/XF lenses fit the Panasonic PT-EX12k / PT-EX16K models. 1.35 ~ 1.8 short zoom. Fits the XF & HF ranges. 1.9 ~ 2.9 standard zoom. Fits the XF & HF ranges. 2 ~ 2.6 standard zoom. Fits the XF & HF ranges. 2.6 ~ 3.5 standard zoom. Fits the XF & HF ranges. 3.5 ~ 4.6 long zoom. Fits the XF & HF ranges. Equivalent to Panasonic ET-ELM01. 7:1 extreme long throw fixed. Fits the XF & HF ranges. 0.8:1 on axis fixed wide. Fits the XF & HF ranges. 1.2 ~ 1.5 short zoom. Fits the XF & HF ranges. Equivalent to the Panasonic ET-ELW06 for PT-EX12k / PT-EX16K. All the Sanyo HF/XF lenses fit these models. 2 ~ 2.6 standard zoom (HD). Fits the XF & HF ranges. Zoom lens 4.5 ~ 6 : 1. Fits the XF & HF ranges, also Panasonic PT-EX12k / PT-EX16K. All the Sanyo HF/XF lenses fit these models. Long throw zoom lens, throw ratio: 6.2 ~ 9.0:1. Fits the XF & HF ranges. F = 2.2 ~ 2.5.